'This child will be a risk to you not just us' an anti-Islamic state activist wrote as he posted this photo on Twitter on Sunday night. 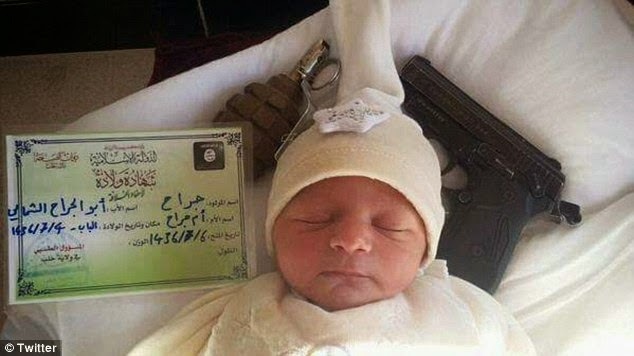 The sick photo shows the newborn baby sleeping next to a handgun, hand grenade and an Islamic State birth certificate. The image was posted through the twitter account of Abu Ward Al-Raqqawi an anti-Islamic State activist in Syria, in the hope of garnering attention to the international threat posed by ISIS. The post said the newborn child is called ‘Jrah’, while his mothers name is ‘Om’ and his fathers name is ‘Abu.’ It also claimed the certificate next to the baby is an 'ISIS issued ID for a child'. The activist was trying to send a message but the photo has angered millions of people around the world.